Non-Newtonian fluid mechanics is often distinguished from its Newtonian counterpart by the additional requirement that first a constitutive equation be specified as part of the problem statement and secondly a suitable wall boundary condition other than the no-slip be imposed as a necessary ingredient. It is also accepted that diverse fluids and diverse wall materials lead to diverse interfacial behaviors. Therefore, the main thrust of this part of the research program is both a theoretical and an experimental study of diverse polymer-wall interfaces. The development of relationships that describe the behavior of such interfaces under flow conditions are necessary in order to gain a better understanding of phenomena such as sharkskin, gross melt fracture and stick-slip. The identification of processing aids that can eliminate such phenomena is a key element in these studies. Polymer flow instabilities and more specifically melt fracture phenomena in polymer processing is of particular importance. Application of interest include extrusion, film blowing, blow molding and coating flows (wire, cable and sheet) of polyolefins, fluoropolymers and other polymers. Methods to enhance the rate of production by eliminating or postponing these phenomena to higher shear rates are also of interest. Processing aids such as fluoroelastomers, stearates and their combination are examined in extrusion and other polymer processing operations in order to evaluate their effectiveness. The rheology and processing of polymer blends are also of particular interest to the research program of Professor Hatzikiriakos. During the processing of polymer blends, there is a variety of phenomena that may take place. At increasing shear/extensional rates, the polymer blends may phase-separate (shear induced de-mixing) and then at higher rates may mix again (shear induced mixing) or vice versa. These effects are dramatic as the homogeneous region in their (polymer blends) phase diagram may be shifted or enlarged by several degrees under flow conditions. This part of the research program focuses on the rheological and thermodynamic behavior of polymer blends under flow (shear/extensional) conditions. The phase behavior of model as well of industrial importance polymer blends is studied both experimentally and theoretically. The results from these fundamental studies are used in order to gain a better understanding on the resulting morphology during processing and its effects on the mechanical properties of final products. Another aspect of the research program in polymer rheology is the development of new techniques to measure the nonlinear rheological viscoelastic properties of molten polymers such as polyolefins, ionomers and hydrogen bonding polymers. The key element of this part of the program is to use the rheological properties measured in the laboratory in order to gain a better understanding of the behavior of polymeric systems in a melt processing operation such as film blowing, film extrusion, film casting, blow molding and coating flows (wire, cable and sheet). Complex fluids, semisolids and solids are of particular importance as well i.e. polymer blends, polyelectrolyte hydrogels (based on nanocrystalline cellulose), cheese, dough, and biomaterials such as nanocrystalline based materials. 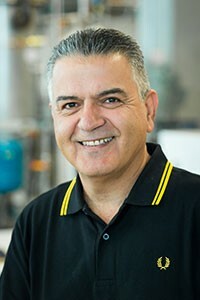 The research interests/efforts of Professor Hatzikiriakos include an integrated study of the paste extrusion process of polytetrafluoroethylene (PTFE) and other polymers (UHMWPE, PEEK), metals and metal oxides. Relevant tests for the rheological characterization of complex materials such as PTFE paste is of primary interest. Other areas of interest include experimental and computational studies of polymer processing operations such as film blowing, film casting, pipe extrusion, profile extrusion, blow molding, thermoforming and embossing. Professor Hatzikiriakos and his students have published over 240 papers. He has edited a book entitled Polymer Processing Instabilities: Understanding and Control (Marcel Dekker). His group is actively collaborating with the University of Crete and the National Technical University of Athens. Professor Hatzikiriakos also serves as an expert witness in polymer patent litigation and dispute and as a consulting engineer to the polymer industry. § T. Tomkovic, E. Mitsoulis and S.G. Hatzikiriakos, “Contraction Flow of Ionomers,” J. Non-Newtonain Fluid Mech., In press (2018). § M. Ebrahimi, V.K. Konagandi and S.G. Hatzikiriakos, “Dynamic Slip of Polydisperse Linear Polymers using Partitioned Plate,” Physics of Fluids, 30, 030601 (2018). § Love-Ese Chile, S. Kaser, S.G. Hatzikiriakos, P. Mehrkhodavandi, “Synthesis and thermorheological analysis of biobased lignin-graft-poly(lactide) copolymers and their blends,” ACS Sustainable Chemistry & Engineering, 6, 1650-1661 (2018). § Anna-Lena Oechsle, Lev Lewis, W.Y. Hamad, S.G. Hatzikiriakos, M.J. MacLachlan,”CO2-Switchable Cellulose Nanocrystal Hydrogels,” Chemistry of Materials, 30, 376-385 (2018). § G. Natale, C. Datt, S.G. Hatzikiriakos, G.J. Elfring,” Autophoretic locomotion in weakly viscoelastic fluids at finite Péclet number,” Physics of Fluids, 29, 123102 (2017). § Love-Ese Chile, P. Mehrkhodavandi, S.G. Hatzikiriakos, “Aromatic interactions in aryl-capped polylactides: A thermorheological investigation,” J. Rheology, 61, 1137-1148 (2017). § S. Zouaghi, T. Six, S. Bellayer, S. Moradi, S. G. Hatzikiriakos, T. Dargent, V. Thomy, Y. Coffinier, C. André, G. Delaplace, M. Jimenez, “Antifouling biomimetic liquid-infused stainless steel: application to dairy industrial processing” ACS Applied Materials & Interfaces, 9, 26565-26573 (2017). § C. Datt, G. Natale, S.G. Hatzikiriakos, G.J. Elfring,”An active particle in a complex fluid,” J. Fluid Mech., 823, 675-688 (2017). § E. Chatzigiannakis, M. Ebrahimi, and S.G. Hatzikiriakos, “On the molecular weight dependence of slip velocity of polymer melts,” J. Rheology, 61, 731-738 (2017). § T. Ebrahimi, H. Taghipour, D. Grießl, P. Mehrkhodavandi, S.G. Hatzikiriakos and E. van Ruymbeke “Binary Blends of Entangled Star and Linear poly(hydroxybutyrate): Effect of Constraint Release and Dynamic Tube Dilation,” Macromolecules, 50, 2535-2546 (2017). § E. Chatzigiannakis, M. Ebrahimi, M.H. Wagner and S.G. Hatzikiriakos,”Wall Slip of Polyisobutylenes: Effect of Molecular Characteristics,” Rheol. Acta, 56, 85-94 (2017). § M. Ebrahimi, V.K. Konaganti, S. Moradi, A.K. Doufas, and S.G. Hatzikiriakos, “Slip of Polymer Melts over Micro/Nano-patterned Surfaces,” Soft Matter, 12, 9759-9768 (2016). § V.K. Konaganti, M. Derakhshandeh, M. Ebrahimi, E. Mitsoulis, S.G. Hatzikiriakos, “Non-isothermal Extrudate Swell”, Physics of Fluids, 28, 123101 (2016). § Ebrahimi T., D.C. Aluthge, S.G. Hatzikiriakos and P. Mehrkhodavandi, “Highly Active Chiral Zinc Catalysts for Immortal Polymerization of b-Butyrolactone Form Melt Processable Syndio-rich Poly(hydroxybutyrate),” Macromolecules, 49, 8812-8824 (2016). § V. Triandafilidi, J Rottler, S.G. Hatzikiriakos, “Molecular Dynamics Simulations of Monodisperse/Bidisperse Polymer Melt Crystallization,” J. Polym. Science, Part B: Polymer Physics, 54, 2318-2326 (2016). § T. Ebrahimi, E. Mamleeva, I. Yu, S.G. Hatzikiriakos and P. Mehrkhodavandi, “The Role of Nitrogen Donors in Zinc Catalysts for Lactide Ring-Opening Polymerization,” Inorg. Chem., 55, 9445-9453 (2016). § M. Ebrahimi, M. Ansari, and S.G. Hatzikiriakos, “Surface Fractionation Effects on Slip of Polydisperse Polymer Melts,” Physics of Fluids, 28, 093101 (1-11) (2016). § V.K. Konaganti, M. Ansari, E. Mitsoulis, S.G. Hatzikiriakos, “The Effect of Damping Function on Extrudate Swell”, J. Non-Newtonian Fluid Mech., 236, 73-82 (2016). § Lev Lewis, M. Derakhshandeh, S.G. Hatzikiriakos, W.Y. Hamad, M.J. MacLachlan,” Hydrothermal Gelation of Aqueous Cellulose Nanocrystal Suspensions,” BioMacromolecules, 27, 2747-2754 (2016). § S. Moradi, N. Hadjesfandiari, S. Toosi, J. Kizhakkedathu, S.G. Hatzikiriakos, “Effect of extreme wettability on platelet adhesion on metallic implants: from superhydrophilicity to superhydrophobicity,” ACS Applied Materials & Interfaces, 8, 17631-17641 (2016). § M.R. Perry, T. Ebrahimi, E. Morgan, P.M. Edwards, S.G. Hatzikiriakos, L.L. Schafer, “Catalytic Synthesis of Secondary Amine Containing Polymers: Variable Hydrogen-Bonding for Tunable Rheological Properties,” Macromolecules, 49, 4423-4430 (2016). § Mirvakili, M.N., H. Van Bui H., J.R. van Ommen, S.G. Hatzikiriakos, P. Englezos, ” Enhanced Barrier Performance of Engineered Paper by Atomic Layer Deposited Al2O3 Thin Films,” ACS Applied Materials & Interfaces, 8, 13590-13600 (2016). § Derakhshandeh M., Noroozi N., L.L. Schafer, D. Vlassopoulos and S.G. Hatzikiriakos, “Dynamics of partially miscible biodegradable polymer blends near their phase transition” Rheologica Acta, 55, 657-671 (2016). § S. Toosi, S. Moradi, M. Ebrahimi, and S.G. Hatzikiriakos: Microfabrication of polymeric surfaces with Extreme Wettability using Hot Embossing,” Applied Surface Science, 378, 426-434 (2016). § Love-Ese Chile, P. Mehrkhodavandi and S.G. Hatzikiriakos, “A comparison of the rheological and mechanical properties of isotactic, syndiotactic and heterotactic PLA,” Macromolecules, 49, 909-919 (2016). § T. Ebrahimi, S.G. Hatzikiriakos, and P. Mehrkhodavandi, “Synthesis and Rheological Characterization of Star-shaped and Linear Poly(hydroxybutyrate),” Macromolecules, 48, 6672-6681 (2015). § S.G Hatzikiriakos, “Slip Mechanisms in Complex Fluid Flows,” Soft Matter, 11, 7851-7856 (2015). § E. Behzadfar, M. Ansari, V.K. Konaganti, S.G. Hatzikiriakos, “Extrudate Swell of HDPE Melts: I. Experimental”, J. Non-Newtonian Fluid Mechnics, 225, 86-93 (2015). § V.K. Konaganti, M. Ansari, E. Mitsoulis, S.G. Hatzikiriakos, “Extrudate Swell of a HDPEMelt: II. Modeling using Integral and Differential Constitutive Equations”, J.Non-Newtonian Fluid Mechnics, 225, 94-105 (2015). § S. Toosi, S. Moradi, S. Kamal, and S. G. Hatzikiriakos, “Superhydrophobic Laser Ablated PTFE Substrates,” J. Applied Surface Sci., 349, 715-723 (2015). § M. Ebrahimi, M. Ansari and S.G. Hatzikiriakos, “Wall Slip of Polydisperse Linear Polymers using Double Reptation,” J. Rheology, 59, 885-901 (2015). § S. Moradi, S. Kamal, and S. G. Hatzikiriakos, “Laser Ablation Induced Micro/Nano-Patterns on Stainless Steel Substrates and their Wettability” Surface Innovations, 3, 151-163 (2015). § S. Safiei-Sabet, W. Hamad and S.G. Hatzikiriakos, “Ionic Strength Effects on the Microstructure and Shear Rheology of Cellulose Nanocrystal Suspensions,” Cellulose, 21, 3347-3359 (2014). § M. Derakhshandeh, G. Mozaffari, A.K. Doufas and S.G. Hatzikiriakos, “Quiescent Crystallization of Polypropylenes: Experiments and Modelling,” Journal of Polymer Science Part B: Polymer Physics, 52, 1259-1275 (2014). § M. Derakhshandeh, A.K. Doufas and S.G. Hatzikiriakos, “Quiescent and Shear-Induced Crystallization of Polypropylenes,” Rheologica Acta, 53, 519-535 (2014). § S. Moradi, P. Englezos and S. G. Hatzikiriakos “Contact Angle Hysteresis in Superhydrophobic Metallic Surfaces”, Langmuir, 30, 3274-3284 (2014). § H. Sharifi, S. G. Hatzikiriakos and P. Englezos, “Rheological Evaluation of Kinetic Hydrate Inhibitors in Brine/n-Heptane Solutions,” AIChE, 60, 2654-2659 (2014). § E. Behzadfar and S.G. Hatzikiriakos, “The Diffusivity of CO2 in Bitumen using Rheometry,” Energy and Fuels, 28, 1304-1311 (2014). § E. Behzadfar and S.G. Hatzikiriakos, “Rheology of Bitumen: Effects of Temperature, Pressure and CO2 Concentration,” Fuel, 116, 578-587 (2014).